Suddenly, there’s a lot of attention about the Book of Enoch. Does it belong in the Bible? Is it genuine? Most modern scholars estimate the older sections of the Book of Enoch date from about 300 BC, and the latest part probably to the first century BC, so that’s a major problem to begin with. This book appears thousands of years after Enoch had lived, and there is no way that any original manuscripts could have survived, and copying errors over thousands of years could have greatly skewed any accuracy of the original, but even if this were the actual work of Enoch, which I don’t believe it is and will prove its not, it has no place in biblical teaching or preaching, and certainly buying the book and the study guides, and so on is not only a waste of money, it’s a waste of time. Even worse, if you are reading and teaching it as theology, then you are going to be reading and teaching error. 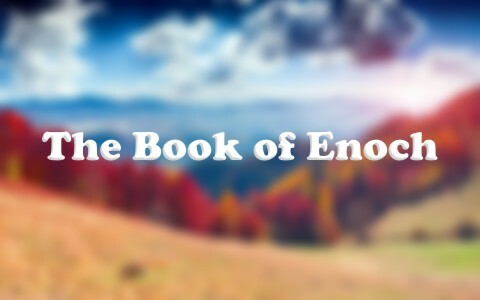 Here is all we know about Enoch and his prophecy; “It was also about these that Enoch, the seventh from Adam, prophesied, saying, “Behold, the Lord comes with ten thousands of his holy ones, to execute judgment on all and to convict all the ungodly of all their deeds of ungodliness that they have committed in such an ungodly way, and of all the harsh things that ungodly sinners have spoken against him” (Jude 1:14-15). In chapter 10 verse 2, Enoch allegedly wrote about Noah, even though the Bible teaches that Enoch was taken up to heaven years before Noah was born. In fact, he was Noah’s great-grandfather. So, though the Book of Enoch is interesting, it is full of theological holes and so we should never read this book except to satisfy our curiosity. I wouldn’t even do that because if you start reading a book that’s supposed to be about God, and it’s full of doctrinal and even a few secular errors, then it’s no better than reading fiction. Did you know that there are other gospels out there? They are allegedly from God or written under the inspiration of the Holy Spirit, but the Holy Spirit doesn’t make mistakes and other gospels are even worse than the Book of Enoch. For example, the lost Gospel of Judas contains heretical teachings that are completely contrary to the gospel accounts of Matthew, Mark, Luke, and John. In one place Judas claims that he was instructed to betray Christ and there are other such outrageous claims, like that Judas was only obeying Jesus command to betray Him with a kiss and also, Jesus supposedly married Mary Magdalene and even had children by her. The problem with that is that there is no secular or early church historical evidence to support these claims. Further, Bible scholars suggest we avoid the Secrets of Enoch, the Conflict of Adam and Eve with Satan, Psalms of Solomon 4, and alleged gospels by Philip, the Apocalypse of Peter, and the Gospel of Mary. Not one of these books is consistent with the 66 books of the Bible so they clearly do not belong in the Bible. Many other books such as 1st Maccabees, the Wisdom of Solomon and other such books (called the Apocrypha) were never placed into the Bible and were rejected by the Jews. Although these extra-biblical books may have some accurate historical accounts, God did not allow them to be accepted as His inspired words and so they were not included in the Bible. The Apostle Paul warned us that “even if we or an angel from heaven should preach to you a gospel contrary to the one we preached to you, let him be accursed” (Gal 1:8). No wonder that Paul was constantly warning the church “to watch out for those who cause divisions and create obstacles contrary to the doctrine that you have been taught; avoid them” (Rom 16:17), and “there are some who trouble you and want to distort the gospel of Christ” (Gal 1:7). I am with Paul who was “astonished that you are so quickly deserting him who called you in the grace of Christ and are turning to a different gospel” (Gal 1:6), so the warning is, “if someone comes and proclaims another Jesus than the one we proclaimed, or if you receive a different spirit from the one you received, or if you accept a different gospel from the one you accepted, you put up with it readily enough” (2nd Cor 11:4). The truth is, “no one can lay a foundation other than that which is laid, which is Jesus Christ” (1st Cor 3:11). Similar reading for you: What Are the Apocrypha Books? Next post: How Do You Know Your Being Called As A Missionary?